There’s no denying that the Big Mac wears the double-patty-burger crown in the fast-food universe, but that hasn’t stopped plenty of other chains from reaching for the crown. Jack in the Box has tried to replicate it with the Bonus Jack, and even Korea’s Lotteria has its own version of the stacked sandwich. 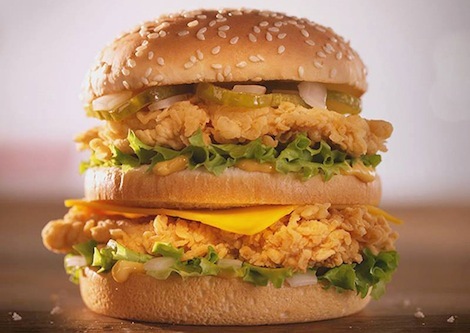 And now, KFC Canada has followed suit with its newest offering, the Big Boss. You have to hand it to KFC, though—while other fast-food chains are shamelessly stealing the Big Mac’s identity, KFC has stayed true to its roots, swapping out regular burger patties with two of its iconic breaded chicken filets.